White wipe clean microfibre boot. These are an ideal boot for use in food or pharmaceutical work. Anti-static and Slip Resistant White Laced Safety Boot includes steel toe cap and Shock absorber heel. Machine washable at 40°C boot with antibacterial lining. Siili White Laced Safety Boot conforms to: EN20345 S2 safety footwear sandards. 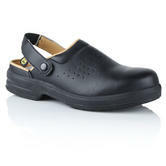 Professional clogs, designed to ensure comfort and prevent the accumulation of static electricity. Wearing ESD footwear helps you avoid damage to sensitive electronic equipment. Siili E103 Safety Work Clogs conforms to: EN61340-5-1 and EN ISO 20345/20347:2007 SRC safety footwear standards. Siili safety boots are Italian, predominantly anti-static and ESD shoes and clogs. Electro Static Discharge (ESD) is crucial in high tech clean rooms and other areas where a build up of natural electric static in the air or body needs to be carefully dissipated/grounded. Many of these shoes are Antistatic, the Siili Safety Anti-static Slip Resistant White Laced Safety Boot is a perfect example of this. This boot is designed to be used for food or pharmaceutical tasks. This is to avoid a build up of charge which can damage computers and electrical devices. Siili ESD shoes are lightweight and comfort fitting.